One of those rare, single cask Bowmore gems IMHO. The balance is near perfect in this expression, but I can't help but think it was in the cask just slightly too long. It would be even better if there was less wood influence and more spirit influence. But that's because I'm a sucker for that old style super-fruity Bowmore spirit which, I've, sadly, only encountered in expressions from 1995. Only topped by the very best, like the 17-yo Craftsmen Collection (85809) and slightly better than the Tempest expressions and the Laimrig OB's, which I both love. Unmistakenly Bowmore, and so much more. Within moment the years-long journey reveals itself, but only at a slow pace. There's ginger, wood chips, salt, velpon glue, brown sugar. 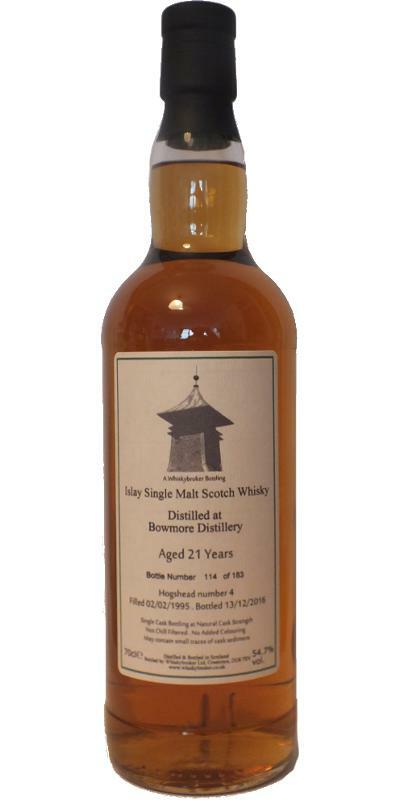 And the oh-so-lovely tropical fruits from the old Bowmore spirit, which is the reason I bought this. All is lightly covered in typical Bowmore peat smoke. Dark sugar, velpon glue, more brown sugar, peat, some smoke, wood. The tropical fruits linger in the back and come forward in waves. Long, not drying and medium bitter. All die off slowly, but the peaty wood lingers long. N: A sweet farmy [not too smokey] number with hints of raisins, grasses, a touch of tobacco=vegetal BO [yep], with a slight oily pong, a little garden feed and pot ale. T: Huge & complex arrival, even when watered down significantly. A little nutty and silky=waxy, almost slimy-waxy mouthfeel. Nose: a right peaty blast tinged with rock salt. Hazelnuts with candy floss and a little soap in the background. Fern, caramel wafers with a flush of raspberry cutting through the earthiness. A charcoal element and water I felt didn't do much here if anything it removed the interesting features. Taste: gritty and earthy with the vegetative peat showing through. Salted caramel mixed with thyme, liquorice and cola cubes. A peppery finish with right at the death a fleeting ghostly flash of soap. Water again expelled the interesting earthy and rugged aspects but did bring a sugary toffee out. Overall: for 21 years I was expecting much more from this bottling however its under £100 and retains enough character to be a solid drammer. Certainly better than most of the official Bowmore's you'll find in the shops at a similar or lower price. Sold out in an hour.